The exploits of Newport RFC are world-renowned. One of the few clubs to have beaten all the major southern hemisphere touring sides, they were the only side to beat the Invincible All Blacks of 1963–64. Amongst the names associated with the club are Arthur 'Monkey' Gould, the first rugby union superstar, and David Watkins, the only man to have captained Great Britain at rugby union and rugby league. Since the regionalisation of Welsh club rugby in 2003, Newport RFC play in the Welsh Premier Division and operate as a feeder club to the Dragons regional team who play in the Pro14. Both Newport RFC and the Dragons play at Rodney Parade near Newport city centre. Nine other rugby union teams playing in the Welsh League are based in Newport; Newport Saracens, Pill Harriers, Newport High School Old Boys, Bettws, Caerleon, Hartridge, Rogerstone, St Julians High School Old Boys and Whiteheads. The 1906 International Lawn Tennis Challenge was the sixth edition of what is now known as the Davis Cup. As defending champions, the British Isles team played host to the competition. For the first time, the ties were not all played at the same location. The "World Group" ties were played at the Newport Athletic Club in Newport, Monmouthshire, United Kingdom from 7–9 June, and the final was played at Worple Road (the former site of the All England Club) in Wimbledon, London, United Kingdom on 15–18 June. Britain retained the Cup for their fourth championship. The Caerleon Roman Fortress and Baths museum (Welsh: Caer a Baddonau Rhufeinig Caerllion Amgueddfa) is a historical site located in the town of Caerleon, South Wales. Near to the city of Newport, it is run by the Welsh historic environment service Cadw. The centre is located at the Newport International Sports Village, Lliswerry in the east of Newport near Newport Stadium and the Wales National Velodrome. It was officially opened 20 April 2013 by Michel Platini, President of UEFA. The £5M complex was a joint venture between UEFA, the Football Association of Wales, Sport Wales and Newport City Council.The Centre is intended to develop the Wales under-21, Wales women's and younger age-group squads. The centre includes two grass pitches and one artificial turf pitch. The centre also provides headquarters for the Welsh Football Trust, the game's development body, with analysis suites, sports science laboratories and coach education facilities. Isca, variously specified as Isca Augusta or Isca Silurum, was the site of a Roman legionary fortress and settlement or vicus, the remains of which lie beneath parts of the present-day suburban village of Caerleon in the north of the city of Newport in South Wales. The site includes Caerleon Amphitheatre and is protected by Cadw. Headquarters of the Legion "II Augusta", which took part in the invasion under Emperor Claudius in 43, Isca is uniquely important for the study of the conquest, pacification and colonisation of Britannia by the Roman army. It was one of only three permanent legionary fortresses in later Roman Britain and, unlike the other sites at Chester and York, its archaeological remains lie relatively undisturbed beneath fields and the town of Caerleon and provide a unique opportunity to study the Roman legions in Britain. Excavations continue to unearth new discoveries, in the late 20th century a complex of very large monumental buildings outside the fortress between the River Usk and the amphitheatre was uncovered. This new area of the canabae was previously unknown. The National Roman Legion Museum (Welsh: Amgueddfa Lleng Rufeinig Cymru) is a museum in Caerleon, near Newport, south-east Wales. It is one of three Roman sites in Caerleon, along with the Baths museum and the open-air ruins of the amphitheatre and barracks. It is part of the wider network of Amgueddfa Cymru – National Museum Wales. Newport Castle (Welsh: Castell Casnewydd) is a ruined castle in Newport, Wales. It was built in the 14th century, probably by Hugh de Audley, 1st Earl of Gloucester or his son-in-law, Ralph, Earl of Stafford, with the purpose of managing the crossing of the River Usk. The castle was used as administrative offices for the collection of rent and dues from local tenants, and was also a residence and a garrison. In 1402 it was sacked by Owain Glyndŵr. It was in disrepair by 1522, and was taken by Oliver Cromwell's forces during the Civil War. Its use declined further in later centuries. It has been a Grade II* Listed building since 1951. Newport Cathedral (Welsh: Eglwys Gadeiriol Casnewydd) is the cathedral of the Diocese of Monmouth, in the Church in Wales, and seat of the Bishop of Monmouth. 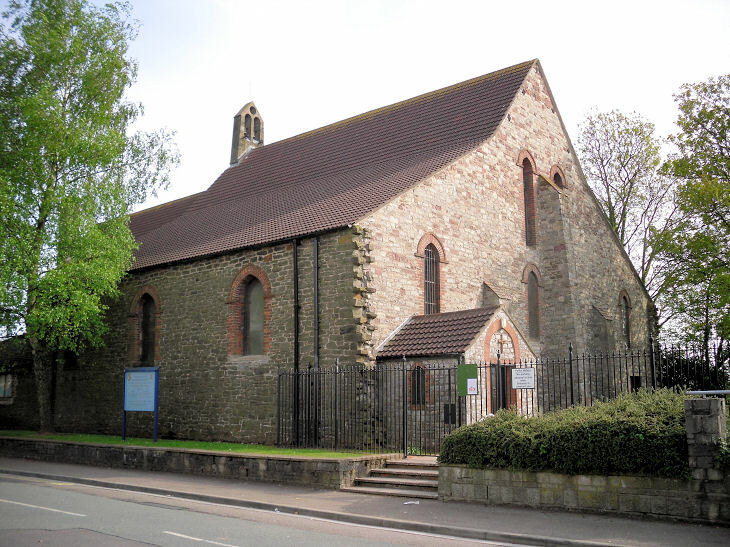 Located in the city of Newport in South East Wales, its full title is Newport Cathedral of St. Woolos, King & Confessor. The Newport Centre is a leisure centre in Newport, South Wales. The Newport Centre is located in Newport city centre on the west bank of the River Usk adjacent to the Kingsway Shopping Centre. It holds events such as concerts, conferences and exhibitions. The centre hosts the Welsh Open snooker tournament as well as international business conferences and exhibitions. The Centre also has suites overlooking the leisure pool and elsewhere; The Riverside Suite, Castle Room, Kingsway Suite, Usk Room, Treetops Suite, and the Emlyn Rooms. On Thursday 6 April, it played host to week 7 of the 2006 Premier League Darts. Newport Corporation Tramways operated a tramway service in Newport between 1894 and 1937. Newport Docks is the collective name for a group of docks in the city of Newport, south-east Wales. By the eighteenth century there were a number of wharves on the west shore of the River Usk; iron and coal were the principal outward traffic. The considerable tidal range and muddy banks made the wharves inconvenient, and as trade grew, the Town Dock was opened in 1842. It was extended to the north in 1858, and trade increased further. The Alexandra (Newport) Dock Company was established and a large dock of the same name was opened in 1875, followed by the South Dock in 1893, which was greatly extended in 1907 and 1914. Newport Docks were said to have the largest extent of water in any dock in the world. The Town Dock has been filled in, but the Alexandra Dock system is still in use, although the vast mineral export traffic has long since ended. Newport Museum and Art Gallery (Welsh: Amgueddfa ac Oriel Gelf Casnewydd) (known locally as the City Museum (Welsh: Amgueddfa Dinas)) is a museum, library and art gallery in the city of Newport, South Wales. It is located in Newport city centre on John Frost Square and is adjoined to the Kingsway Shopping Centre. Newport West railway station is a proposed station to serve the western suburbs of the city of Newport, Wales. The Newport City Council unitary development plan sets aside an area in Coedkernew adjacent to the Great Western Main Line for the station. As of May 2008 three parcels of land have been acquired by the urban regeneration company Newport Unlimited at the site of the station. The Network Rail Route Utilisation Strategy published in November 2008 confirms the SEWTA aspiration for a station in Coedkernew. Newport railway station (Welsh: Casnewydd) is the third-busiest station in Wales (after Cardiff Central and Cardiff Queen Street), situated in Newport city centre. It is 133.5 miles (215 km) from London Paddington on the British railway network. The station was originally opened in 1850 by the South Wales Railway Company and was greatly expanded in 1928. A new station building was built in 2010 with four full size platforms, to facilitate new Great Western Railway 10-car Intercity Express Programme trains. The station is owned by Network Rail and managed by Transport for Wales. The main station entrance is located on Queensway, connected by Station Approach to the High Street, with a further entrance adjoined to the National Car Parks site at its rear, reached from Devon Place. St. Bride's or St. Bride's Wentloog (Welsh: Llansanffraid Gwynllŵg) is a small hamlet to the south west of the city of Newport in South Wales. Tredegar House (Welsh: Tŷ Tredegar) is a 17th-century Charles II-era country house mansion in Coedkernew, at the western edge of the city of Newport, Wales. For over five hundred years it was home to the Morgan family, later Lords Tredegar; one of the most powerful and influential families in the area. Described as "The grandest and most exuberant country house" in Monmouthshire and one of the "outstanding houses of the Restoration period in the whole of Britain", the mansion stands in a reduced landscaped garden of 90 acres (0.36 km2) (0.14 of a square mile) forming the non-residential part of Tredegar Park. The property became a Grade I listed building on 3 March 1952 and has been under the care of the National Trust since March 2012. West Usk Lighthouse is a Grade II-listed building on the Severn Estuary at the mouth of the River Usk south of the city of Newport, South Wales.